The Entertainer App Giveaway – Sign up to Win a free 2014 Entertainer Mobile Package! As the first giveaway I am doing on my food blog, I thought it would be appropriate to do one for The Entertainer, a company that gives great value on so many dining venues across Dubai. In fact, the Entertainer books currently offer nearly 2,000 buy one get one free vouchers to many restaurants, cafes, water parks, golf courses, hotels and attractions all over the UAE and many new locations across the world. 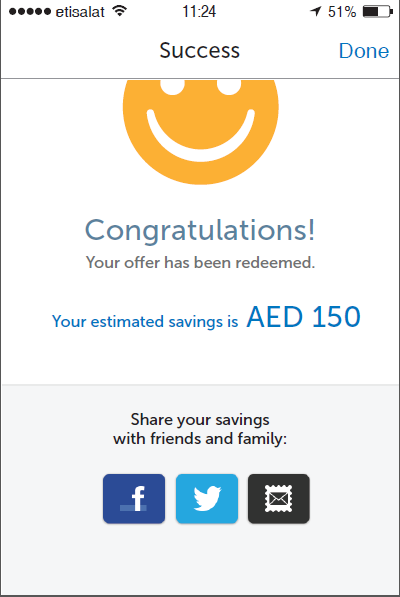 As I have lived in Dubai for 8 years now, I am quite familiar with using the Entertainer vouchers. And as they have packed more deals inside the books, I am also familiar with how heavy the books that hold the vouchers have become. Fitting a huge book in your tiny clutch bag when you are going out isn’t always convenient, and the worst feeling is if you go out spontaneously and you realize you’ve left your Entertainer books at home. But now those little inconveniences will disappear, as the Entertainer has found a way to bring both spontaneity and mobility to all their offers. They have launched the Entertainer App which you can download for free and access directly through your smartphone. You can search for a location nearby, redeem your e-voucher instantly, and also see how much you saved. First download the Entertainer App on your smartphone. Show your server your e-voucher from your Entertainer App. Redeem instantly! See how much you have saved! You can even share with your friends. Available for iPhone, Android, and Blackberry, you can download the Entertainer App for free and after buying an Entertainer mobile app package, can redeem all the buy one get one free offers. As a December 2013 promotion, the Entertainer app comes preloaded with some great offers valid for this month, so you can download it and try it out now. For more detailed information on how to use the Entertainer App, click here. And now for the giveaway. 1. Sign up HERE on the Entertainer facebook page (full name & email required) – Like the page and share the competition with your friends! 2. Like the Pantry Diva Facebook page to get more updates, offers, and of course recipes. Winners will be chosen on Monday December 9, 2013 so sign up today! Good Luck to all my Pantry Diva followers! Some great savings in the new year await you! This entry was posted in Pantry Diva Events and tagged Android, Dubai, Entertainer, Giveaway, iPhone, Mobile app, United Arab Emirates, Voucher by thepantrydiva. Bookmark the permalink.